Now that we understand the mechanics of price indices and inflation rates, let’s look at the most commonly used price indices in the real world. In this section we will discuss the consumer price index. In subsequent sections we will examine the GDP deflator, the producer price index and others. The most well known price index in the United States is the Consumer Price Index (CPI). When the rate of inflation is announced in the media, that rate is usually the percent change in the CPI. The CPI is calculated by government statisticians at the U.S. Bureau of Labor Statistics based on the prices in a fixed basket of goods and services that represents the purchases of the average family of four. HOW DO U.S. GOVERNMENT STATISTICIANS MEASURE THE CONSUMER PRICE INDEX? When the U.S. Bureau of Labor Statistics (BLS) calculates the Consumer Price Index, the first task is to decide on a basket of goods that is representative of the purchases of the average household. This is done by using the Consumer Expenditure Survey, a national survey of about 7,000 households, which provides detailed information on spending habits. 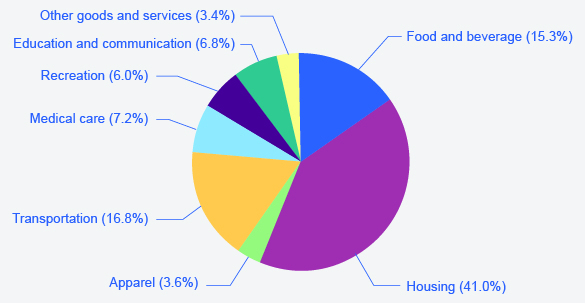 Consumer expenditures are broken up into eight major groups, which in turn are broken up into more than 200 individual item categories. The BLS currently uses 1982–1984 as the base period. For each of the 200 individual expenditure items, the BLS chooses several hundred very specific examples of that item and looks at the prices of those examples. So, in figuring out the “breakfast cereal” item under the overall category of “foods and beverages,” the BLS picks several hundred examples of breakfast cereal. One example might be the price of a 24-oz. box of a particular brand of cereal sold at a particular store. The specific products and sizes and stores chosen are statistically selected to reflect what people buy and where they shop. The basket of goods in the Consumer Price Index thus consists of about 80,000 products; that is, several hundred specific products in over 200 broad-item categories. About one-quarter of these 80,000 specific products are rotated out of the sample each year, and replaced with a different set of products. The next step is to collect data on prices. Data collectors visit or call about 23,000 stores in 87 urban areas all over the United States every month to collect prices on these 80,000 specific products. A survey of 50,000 landlords or tenants is also carried out to collect information about rents. The Consumer Price Index is then calculated by taking the 80,000 prices of individual products and combining them, using weights (as shown in Figure 1) determined by the quantities of these products that people buy and allowing for factors like substitution between goods and quality improvements, into price indices for the 200 or so overall items. Then, the price indices for the 200 items are combined into an overall Consumer Price Index. Price indices are often used to measure the cost of living. Suppose you have just graduated from college and you are offered a job in San Francisco at a starting salary of $75,000 per year. That sounds fantastic, but since you’ve studied macroeconomics, you understand that what matters is not your nominal salary, but rather your real income, the purchasing power of your salary adjusted for the cost of living. Computing your real income is straightforward if you have a price index for goods and services you would spend your paycheck on if you lived in San Francisco. As we showed in the last module when solving for real GDP, real measurements are nominal measurements divided by the appropriate price index. What price index should you use? While the BLS reports a generic (nationwide) CPI, it also publishes Consumer Price Indices for major regions of the country and also for major metropolitan areas, including San Francisco. The CPI for the San Francisco area would be the best price index for figuring out the real purchasing power of a salary in that city. In this video, you’ll see an example of the consumer price index from the FRED database. If we look at data from 1973, the CPI was 44.425. In 1974, the average price of the CPI basket rose to 49.317. So what is the rate of inflation?